Undeniably excessive I suppose. We didn’t have any bread and I didn’t want tomatoes and eggs again, so I picked 2 flowers, put a heaped teaspoon of ricotta into each, pulled together the top, swished them about in a batter made from 1 tablespoon of plain flower mixed with half a cup of water that I’d mixed until smooth, then shallow fried in some hot light olive oil, turning until all sides were crisp. Last night I cooked a punnet of strawberries that had gone too far and wouldn’t be good raw with a heaped tablespoon of sugar, some star anise, a little water and a little Pernod that was given as a present by some friends who visited from Provence. The Pernod is not essential (and star anise makes sure there’s a good hit of aniseed) but it was very delicious. I chilled them it in the fridge overnight. 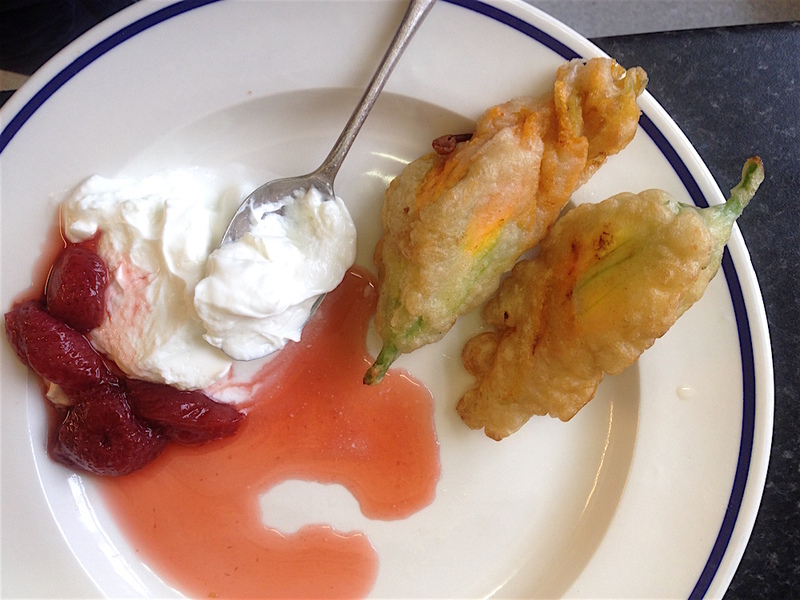 I swiped the fried courgette flowers through the Greek yogurt, picking up a strawberry on the way. Smartened up this could be a nice dessert – sort of like fresh doughnuts or something.